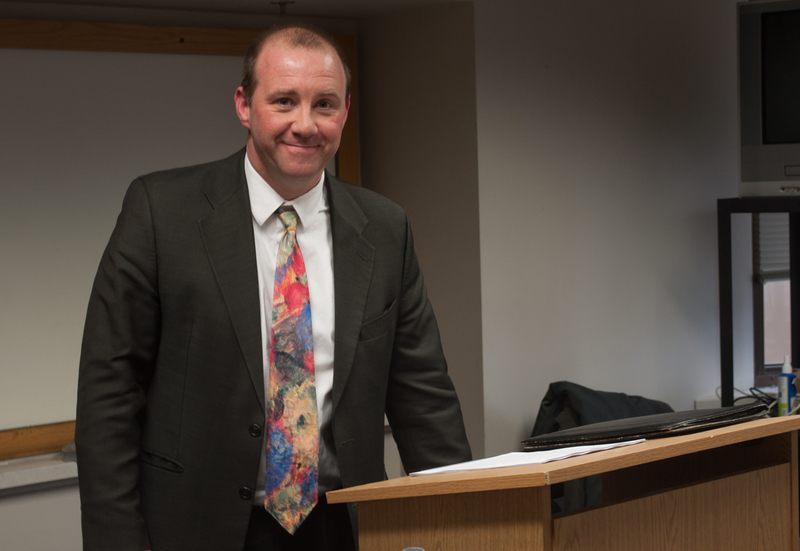 Professor of Irish Language and Literature Brian Ó Conchubhair delivered the lecture “1916 and High Modernism,” focused on a re-evaluation of Eoghan Ó Tuairisc’s novel “Dé Luain” in the context of modernism Friday in Flanner Hall. This was the final lecture in the Lectures and Public Talks Series sponsored by the Keough-Naughton Institute for Irish Studies. “Dé Luain” is set during the Easter Rising of 1916 when a number of Irish Republicans proclaimed independence and launched an armed campaign against British forces. Ó Conchubhair said the novel is a profound piece of modernist literature rather than a detailed historical novel. “Tuairisc draws attention to ‘Dé Luain’s’ own fictional nature with a clear divide between the physical and the intellectual, emotional world,” he said. Ó Conchubhair said the novel intentionally avoids portraying the action and violence of the conflict in favor of examining character’s thoughts and reactions. “This is not a straightforward action-driven narrative,” he said. Many parallels are evident between James Joyce’s seminal modernist work “Ulysses” and “Dé Luain,” Ó Conchubhair said. Both novels share the same setting, Dublin, and depict events over a small window of time with similar themes. Ó Conchubhair also said the work had other influences, including Shakespeare and Tolstoy. As for the characters in Ó Tuairisc’s work, Ó Conchubhair said Tuairisc maintains a reasonably impartial but broadly sympathetic view for most of his characters in contrast to most portrayals of the 1916 uprising. “Ó Tuairisc’s main characters are Irish language exemplars of the modernist anti-heroes,” he said. “Dé Luain” was published at a time when the events of 1916 were already receiving attention from various forms of media, including television programs and documentaries, Ó Conchubhair said, which further reinforces his claim that “Dé Luain” is more of a modernist novel than a work of history. “It is prevented from being a pure historical novel because it stops before the actual events of the Easter rising,” he said. Ó Conchubhair said “Dé Luain” is also not very accessible for an unprepared reader.